Understanding how shipping rates work is critical to running a successful online business, and Ecwid makes setting up shipping rates for your online store very straightforward. Before you begin selling items, you’ll want to determine how your product will get to the buyers, calculate exactly how much different methods of shipping cost, and factor that amounts into what you charge your customers. You want to find the best balance between covering your costs without charging too much that your potential customer abandons the cart. Ecwid allows you to offer a variety of shipping services, as well as adjust for various types of charges depending on the type of product. In some cases, you may want to absorb freight in the price so you can offer free shipping to your customers. What Shipping Methods Are There in Ecwid? The four primary shipping methods offered by Ecwid are carrier-calculated, flat rate, order pickup or custom table and shipping freight. Also known as real-time shipping, carrier-calculated shipping allows you to pull data from shipping companies, such as FedEx, UPS, USPS and more. The rates will be determined by your location, the destination and the weight of the product. This offers you the familiarity of established services, the ease of automatic shipping estimates and the potential for specially negotiated shipping rates. There’s also an opportunity to specify dimensions — the length, width, and height — for each product in your store and get more accurate carrier-calculated shipping rates. It will work for you if you are using FedEx, UPS, USPS, Australia Post, Brasil Correios, and Canada Post to calculate shipping rates in real time. However, the carrier calculated method might also limit the flexibility and customizable options needed for certain businesses. The flat rate shipping option allows you to set one simple shipping cost that will be charged to all of your customers regardless of the subtotal or order rate. You can define one fixed shipping charge or a fixed percent rate, as well as offer a variety of fixed rates depending on the destination. Flat rate shipping streamlines the checkout process for your customers and is also great for small businesses and start-ups whose customers might just be ordering one item or a few products. Downsides of flat rate shipping include losing the flexibility of shipping to different locations with different pricing and needing to absorb excess costs, especially internationally where shipping costs can vary dramatically. 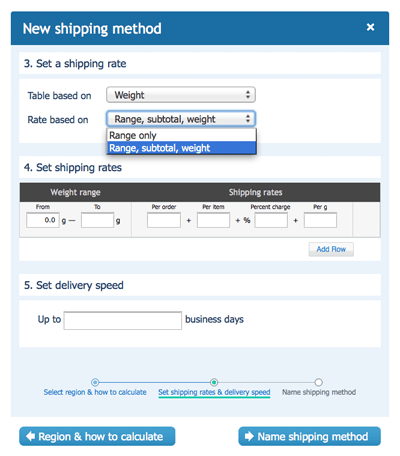 You can avoid this is with a custom table, which allows you to charge your customers what shipping actually costs your business. Use carrier services or establish your own estimates to include variables such as weight, delivery speed and subtotal. If you have a diverse inventory, you can further specify costs by setting up shipping freight per product and set up a cost for each item. However, custom tables and shipping freight per product can be confusing or difficult for some customers and may deter them from purchasing if they don’t understand. An excellent option for many small businesses or those looking to simplify the process for customers is to use free shipping. In this case, you absorb the entire price of shipping and offer free delivery to all zones or select ones. It is frequently used for local deliveries. Simply choose the flat rate shipping option and set the shipping cost to zero or apply free shipping to certain products or destinations by using the shipping freight or custom table. You can offer in-store pickup if you have a retail shop, a pop-up store, a partner with brick and mortar store or if you sell on the local flea market. In-store pickup saves you expenses on shipping and at the same time makes checkout faster for your customers, as they don’t have to enter their shipping address. Free shipping simplifies the checkout process for customers and adds an enticing incentive to purchase. However, absorbing the costs of shipping can get expensive if you don’t limit the zones. Ecwid offers your business a wide variety of shipping options so you can choose the one most suitable to your needs or employ several of them to give you flexibility. If your product is downloadable, you can even avoid shipping settings and costs altogether. Learn more at the Ecwid Knowledge Base, and we invite you to share any ideas or suggestions you might have.